Can you believe it’s nearly July? Picnics, potlucks, and barbecues are in full swing. Though I can never get enough fresh watermelon and grilled corn, it is nice to feel like I can contribute a main course at an event of this type. 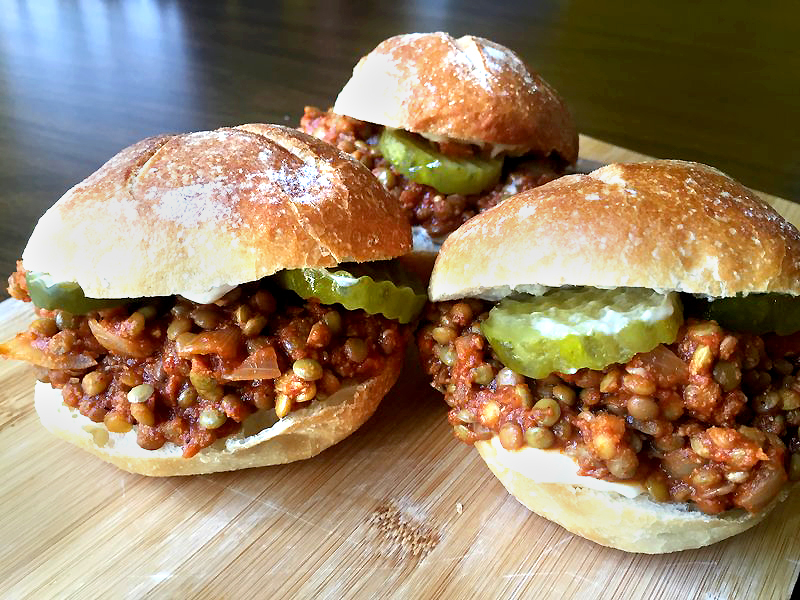 Enter: Lentil Sloppy Joes! These little sammies are packed with protein and flavor. Extremely easy to make for any level cook and a welcome departure from their meat-filled cousin. These Lentil Joes will make the perfect addition to your 4th of July gathering! 2. Sauté onion in coconut oil over medium heat until they begin to brown. 4. Add tomato sauce and spices. Stir until well mixed and lentils are warmed. 5. Transfer Lentil Sloppy Joe mix to another bowl. 6. Assemble sandwiches with Lentil Sloppy Joe mix, vegan mayo, and dill pickle chips. Note* You will see in the video I added the lentils 1 cup at a time. Feel free to split them up as I have or add them all at once.